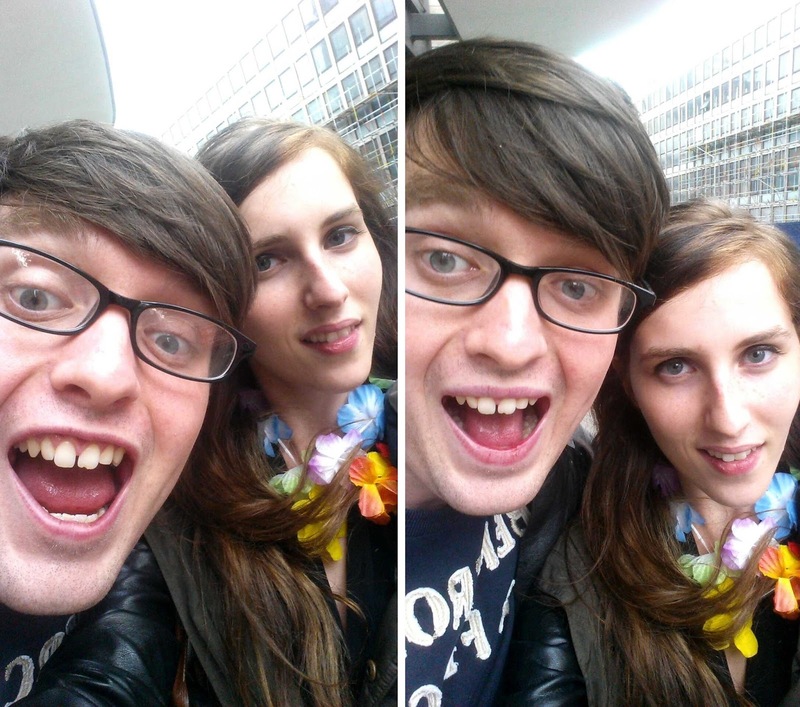 After my first little visit to Kanaloa with Team Costa I knew I wanted to go back ASAP so Andrew and I went along on Friday after work last week! We arrived at about 6.10 and it was already full of business people relaxing after a bust working week! As we walked in, we were greeted with flower garlands and taken over the little tropical bridge to my pre booked table! The club itself looks amazing, I was just looking back over the photos and I could actually believe that I was no longer in England - I felt instantly transported from the busy city center of London to a hidden paradise, I felt like I was going to leave and have to walk along the beach to get home. Everyone was dressed in tropical dresses and hawaiian shirts which was great and the service was great too - Marta (Possibly Martha?) Our waitress, was friendly and efficient and Andrew told me I must add that she was attractive too haha she was great. Next up we ordered a big platter, Andrew hates going out to eat and then to a bar/club as we always eat too much and feel ill so we decided to get food in the club and it was perfect! So tasty and a great amount for the two of us. It was just my style of food, sticky ribs, lamb chops, breaded squid, prawn crackers, edamame beans and tempura prawns with lots of sticky sauces - so yummy! ok, now for the crazy part haha Since I was here to experience the club Andrew decided that we should order one of there sharer cocktails, another thing I've always wanted to try. He didn't seem to care that there were only two of us and went ahead and ordered a "Chest Of Fire" which underneath said, serves 10! A big treasure chest came out along with sparklers, mist and a bottle of champagne which was poured into the chest at our table. It was such an experience and I loved it! Everyone was a bit starey but I guess that's because it was like 7pm and there was only 2 of us to get though it haha. 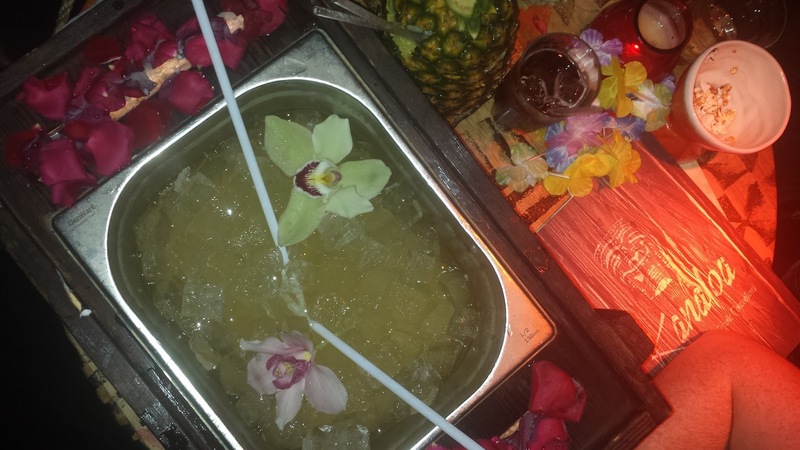 The cocktail itself was delicious, I really enjoyed it - white rum, fruit juice and a whole bottle of champagne poured into a tray of ice with the prettiest flowers on top! I had such a great time and that was just for after work drinks, I definitely want to come back for my birthday for a proper night out!! Also, its such a great location for us, just a five minute walk from chancery lane station and were on the central line home! 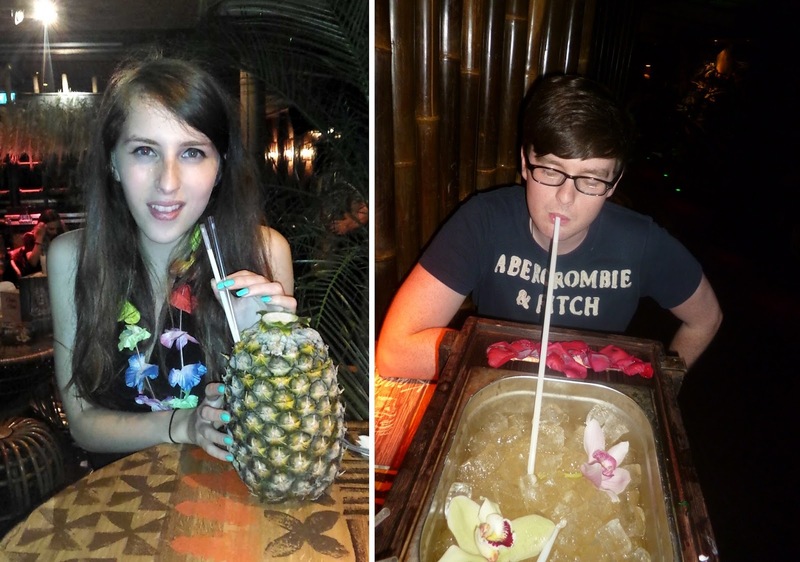 Thanks for having us Kanaloa!